ALL NEW 2016-2017 WORLD’S GREATEST CONTEST FROM PACIFIC INDEPENDENT INSURANCE AGENCY – SCORE $20 FOR YOUR ARIZONA SCHOOL! Announcing the all NEW Pacific Insurance Agency 2016-17 SCORE $20 Bucks to Your Arizona School’s Fund for new athletic equipment, band, drama, theater, arts, sports and learning materials! Pacific Insurance Agency wants to partner with you to increase opportunities for students, parents and faculty to upgrade equipment and supplies at your local Arizona schools! Funds are limited and we encourage parents, grandparents, friends and family to contact us today at www.pacins.com or 520-444-8607 to start the process. Just follow the steps listed below and we will make sure your school of choice receives $20 in your name! BONUS DRAWING FOR $500! Instagram, Facebook and Social Media your way to a BIG WIN for Your School and Chance to Win Extra $500! We are drawing for a special $500 donation to an Arizona School who shares this page to their social media circles on Facebook and Instagram and has the most quote inquiries! The will be on 02/01/2017 and awarded 03/01/2017 to the winning school. Top 3 “social media” sharing schools will be in the final drawing for $500! Be sure to use the #AZSCHOOLSWIN! in your posts and pics. HOW TO WIN? Pass this pic or flyer to your Parents, Grandparents, Neighbors and Teachers to get the most for your school! Limit one $20 donation per household, must be Arizona resident, own a car with insurance, must be 21 or older and subject to underwriting and qualifications. 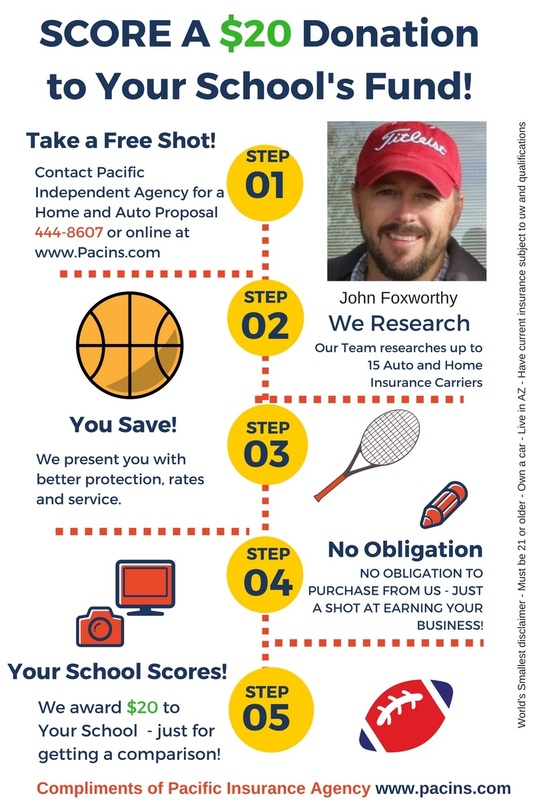 A proposal consists of allowing Pacific to check rates for auto/and/or home insurance. No obligation to purchase. BE SURE TO PUT IN REMARKS SECTION OR WHEN CALLING #AZSCHOOLSWIN! No obligation to purchase. Pacific Insurance reserves the right to end promotion at anytime. GO! Previous Post: 7 Tips Your Insurance Agent or Company Hopes You NEVER Read!